It’s said that testings and trials follow victories. I don’t know that it’s always true, but it was for Elijah. He was a fiery prophet and a true man of God. Since we’re just regular people, that should make us feel better about our own failures and weaknesses. It’s entirely possible to be on top of the mountain one moment and running scared the next. That’s a synopsis of what happened to Elijah. One day he’s proving God is God and the next he’s running for his life because a girl called him out. What was behind his epic failure? Because of that he got discouraged spiritually and depleted physically. He became isolated and overwhelmed. God sent an angel to revive him with food and water. I wonder how many times God has sent help to you and me and we didn’t really see it for what it was. Elijah regains his strength and gets himself to a place called the mountain of God. We need to keep that address in our phones for the times when we get a little lost! He finds a cave and there he hears from God. Elijah has already asked God to take his life. He’s done, he’s ready to give up completely. The second mistake was forgetting His calling, his mission, the people he’s suppose to help. That all got swept aside by a giant wave of self-pity. 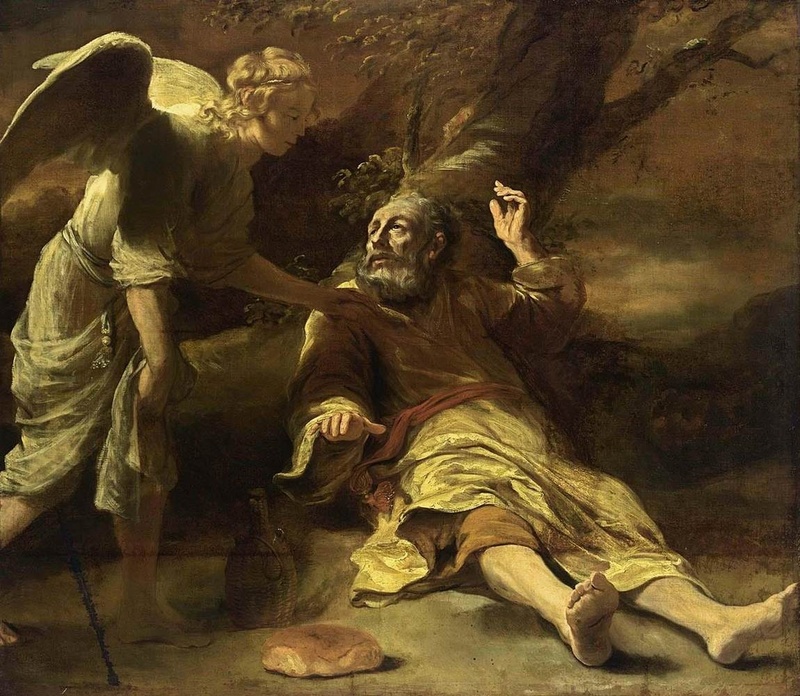 He doesn’t actually answer God’s question, instead he tells God how zealous he’s been at work, but that he’s the only one left in Israel that cares at all about God. God has Elijah go out to the mouth of the cave. There he witnesses a big storm, an earthquake, and a fire, but God isn’t in any of those things. Then Elijah hears a still small voice. He gives God the same non-answer he gave Him earlier. God gives him some specific instructions. This is key for us. In the middle of discouragement God asks us questions. If we’ll listen to that still small voice, guidance will come through loud and clear. God reminds us that our lives have a purpose. That we’re on a mission! We are all on a mission for Him. Finally God tells the prophet that there are 7000 others who still worship Him. The last mistake Elijah made was not finding fellowship with other believers, other God worshippers. Encouragement, community, and shared worship was available, but his eyes were on his enemies instead of his friends. What can we learn from a prophet who gave in and gave up? Respond to God before reacting to people. Remember your calling and the glorious destiny God has planned for you. Find the support of others who love God too. Get in a place where you can hear the still small voice. Then do what He tells you to do. I so needed this today Kelly, Satan is trying to have his way with my brain lately, causing much doubt and discouragement. It’s funny because just this morning I sent out an sos to my support system for prayer and confirmation. Sometimes I feel so emotionally needy! Glad to know that I am in good company with someone so awesome as Elijah!